Bowie’s first marriage to Cypriot-American model Angela Bowie ended in divorce and estrangement. Angela, or ‘Angie’ as she is known, was only 19 when she met Bowie at a gig at The Roundhouse in London in 1969. The pair were married one year later and a year after that welcomed their son, Duncan Zowie Haywood Jones. Following their divorce in 1980, Angela has said she lost contact with both Bowie and Duncan and hinted at her parents’ strained relationship with her former husband. 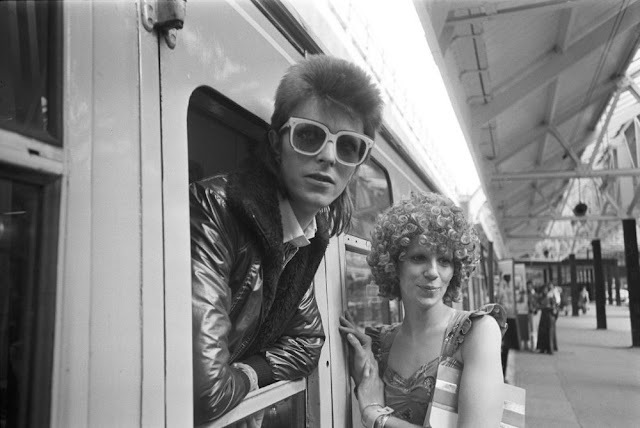 Here are some interesting photos of David Bowie with his wife Angie Bowie at Victoria station before he left on a train to Paris in July 1973.